Mesa Schumacher of Mesa Information Illustration collaborated with researchers at Stanford to create the cover illustration for their 2015 fall issue. On the cover: The human and chimpanzee craniofacial complex has diverged significantly since our common ancestor over 5 million years ago. These changes are driven by patterning differences during early embryogenesis. In this issue of Cell, Prescott et al. (pp. 68–83) use human and chimpanzee iPSC-based cell models to explore how these patterning differences are encoded in neural crest cells. They catalog the divergence of craniofacial enhancers and associated changes in gene expression between humans and chimpanzees. 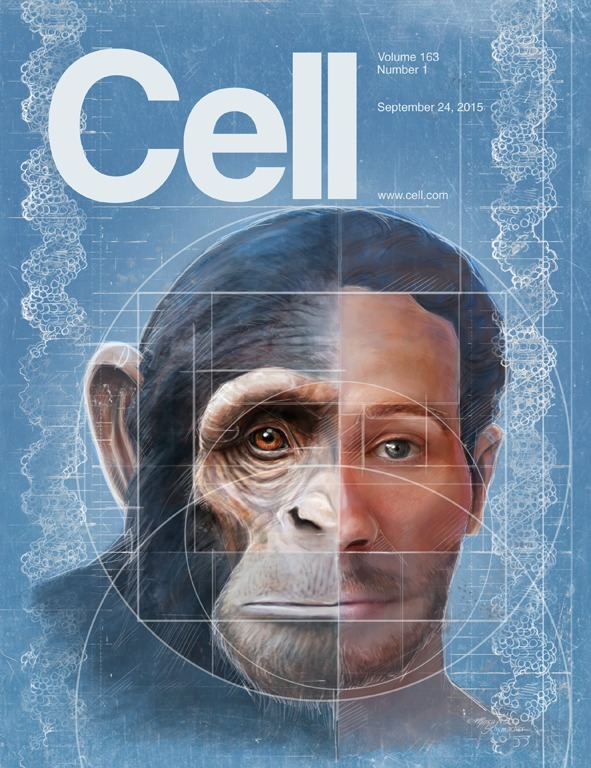 The cover image emphasizes how our craniofacial architecture has shifted in recent evolution and illustrates that the blueprint for this change is encoded in DNA. Printed with permission from Mesa Schumacher. Mesa Schumacher is an international artist and illustrator working out of Baltimore. She specializes in aesthetic display of information, especially medical and scientific subject matter. Explore her full body of work through her Medical Illustration Sourcebook portfolio and at mesaschumacher.com.